It's so sad that nobody has anything to say about Lake Huron! I'm Here to stick up for her. If you are in the Great Lakes, there is no better place to cruise than the North Channel, located in the northernmost corner of Lake Huron, starting essentially from the mouth of the St Marys river and eastward. The North Channel is the stretch of water between Manitoulin Island (the largest freshwater island in the world) and Ontario, Canada. Apart from the Manitoulin, there are literally thousands of smaller to moderately sized island in the region, most of which offer a wealth of natural beauty. Tobermory, Ontario. 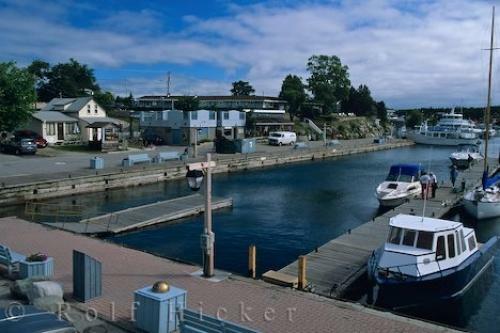 At the tip of the Bruce Peninsula lays the small town of Tobermory, the self-proclaimed "Dive Capitol of The World" It is build around a short channel and its harbor is big enough to house large cruisers. Awesome town. All around it are very shallow wrecks of large wooden schooners and other various craft from long ago. Rent some snorkel equipment and take a look- highly recommended first stop. Kagawong. Kagawong is a small town on Manitoulin Island. Besides being a fun small town to visit, it has Bridal Veil Falls, a wonderful waterfall that lives up to its name as a veil. The Benjamin Islands are about halfway through the channel. 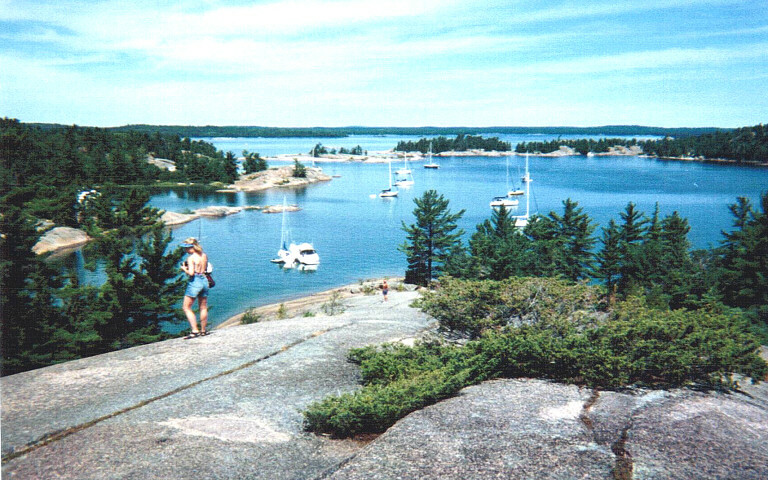 They are a popular spot for cruisers and offer awesome places to tie up to trees and have a campfire on the rocky shoreline of these small islands. Uninhabited. Little Current. I believe it is the largest town on Manitoulin. at a point where a drawbridge connects Manitoulin to mainland Ontario, you must pass through. Its a fun little town that caters to cruisers and is a good place to stock up on provisions and go to the bar. There are many, many more places to visit in the area. Remember that all throughout there is amazing hiking to be had. If you start in the east and head west you can have a welcomed return to civilization at the end of your trip by going to Mackinac island. These are some of the most awesome places i have ever been on a boat, or in my life even. When i went through the channel (both times) i was on a 65 foot steel schooner, and was therefore draft-limited in where i could go. With a small cruiser, the peace of mind would be much greater and the places you could go would expand greatly. If anyone has any questions, has been to or plans on going to the North Channel, or just has any comments, feel free to post! I join you in the lack of stuff here. Five years ago I bought 2 acres on the channel in Bruce Mines for a measly $35K USD. 150x700 with deep water access right on my shore and a city marina that costs only $1400 a season for dockage and winter storage combined. We purchased our first sailboat last year to try the cruise thing. Just an inexpensive Catalina 22. We camped on it for 8 days. Sailed from Bruce Mines to St. Josephs Milvern Bay to Horseshoe Island to Detour and back. We had a great time on our real first sail excursion. We liked everything but the boat being a little small for camping with no separate head. We solved that by selling it and replacing it with a US 25. That hasn't been in the water for us yet because of a move. But a good move the Michigan's UP. I am now only 2 hours away from Bruce Mines and one hour from Superior or Michigan. Soon spring will be here and I'll be getting her ready for cruising. Last edited by geraldartman; 11-23-2008 at 10:06 PM. I've been to Horseshoe Island...I loved the place. We anchored off in that little recess that isn't the main bay, but I took the tender for a row into the horseshoe alone and just laid back and drifted as the purple sunset clouds went by and some deer romped through the woods. The American side doesn't have as much to offer in terms of geographical interest, but Horseshoe island is a gem. Best of luck to you with your new boat. I hope you get to see all the awesome stuff there is to see up there. You are fortunate for being so close to the Islands, I have at the very least a 20 hour sail to even get to Tobermory, since I live in Port Huron. PS, Have you ever been to Batchawana Bay? The provincial park (i cant recall the name) up there is awesome, along with Agawa rock hieroglyphs. Haven't been that far yet. I was really excited about Fort St. Joseph. I was thinking like Mackinaw. What a let down. There isn't a building standing or reconstructed. Of course, it is our fault, we burned it down in the was of 1812 after the sly Brits took Mackinaw. But our revenge was sweet. We destroyed St. Joe where they came from, then after they moved to Drummond, they tricked the survey group into placing that into US hands, so the Brits out again with nowhere to go. If you check property values on Manitoulin you'll be surprised, but getting there is a long ride. Little Current is where the bridge is and from the Soo is it is a 90 mile drive to the south of the island to turn and drive back north perhaps 50 miles of 2 lane back. Port Huron is nice though. Lots of Artman's there compliments of my uncle and his 9 children. My grandfather worked for Detroit Edison at the Marysville plant until retirement. He sailed on the lakes when young. c'mon, tell the rest of the story...the real facts. the mosquitos are as big as barn swallows and bite like the dickens. when they are not out in the evening ruining a pleasant sunset, the black flies are around and they are even worse. they sting like bees. if you can soak in neet for a few days you might be able to minimize the terror of huge swarms of biting flies. But don't go to shore on any of those hiking trails. there's an unending carpet of poison ivy that will get through your pants right to your skin. Of course under all that poison ivy lurk thousands upon thousands of Missasauga rattlers the size of baseball bats with a particularly deadly venom. So stay on your boat where your chances with the flies are much better. of course the black bears are known to be good swimmers. as for the boating, the north channel was charted in about 1650. the rocky pinnacles are quite unforgiving. you can be sailing along in 50' of water and then come upon a nice pinnacle just 2 or 3 feet below the surface. plan on having a life raft because there are no towing services within a hundred miles. also bring your own medical kit as there isn't any way to contact coast guard if you break or cut something. don't worry about heat stroke as the temps rarely get over 65 degrees, usually more like 45 degrees. if you are comfortable with 45 degree temps, you'll love the swimming. the lightning storms are sure to impress, don't worry you'll get plenty of oportunity to witness these forces of nature. Enjoy that long treck up the barren shores of Lake Huron to get to this wonder of the north woods!! Xort - you may want to get your facts straight before going on your next rant. I've never seen a Missassauga rattler yet, they are further south in the Georgian Bay area. Black flies are in May. Mosquitos are bad in certain areas in certain times of the summer and they are usually done by 10pm. Hasn't ruined one of my nights yet. Yes, we have bears, deers and moose...they don't tend to swim up to boats. My charts read 1991, not 1650. Funny, the marina that I'm at has a towing service as the does one of the other local marinas. The Coast Guard is available on channel 16 and is just as quick to respond as anywhere else....as is our police service. Your summers are no warmer than ours. So if our sailing grounds are so terrible (rated in the top 10 in the world) why do so many Americans make the treck up each summer? First of all, most of the things you list here are common thing for a hiker to run into. Bears, snakes, moose, and poison ivy are a fact of life in northern nature settings, and all can be dealt with with a little prudence and pre-caution. I also have never seen a snake in the north channel. Poison Ivy and snake bites can generally be avoided by keeping an eye out and wearing boots with long pants...this is basic knowledge for anybody that has spent more than a day in real wilderness. Bears and Moose are a slim chance of danger that one has to live with, and can also be very interesting and enjoyable to watch. Yes there are bugs...again, get over it. They dont come in the apocalyptic swarms that you describe and are just as bas as anywhere else in the woods in michigan or ontario. Yes, there are many navigational obstacles in the north channel, and yes, there are some mistakes on the charts...this is why you need to be a competent navigator and go slow or use a lead line in questionable areas. The coast guard does not have a near-by station, and yes it would take a long time to get a response from them, but while in the channel, a boat called a mayday that had run aground (not because of bad charts, but because of incompetence. The fact that they didnt call a pon pon instead of a mayday when nobody's life was at risk is a testament to this). Within 20 minutes, 3 power cruisers were on the scene, and within 35 minutes, our 65 foot schooner was on the scene, and within 50 minutes, the boat was off the rocks and on it merry way to get a diver to inspect the hull (which, by the way, was a service found on Manitoulin island in Kagawong). Yes, the lightening storms are very impressive in the channel, and i had the honor of experiencing three of them, all of which had wind gusts over 30 knots and driving rain. If you call yourself a sailor and find these conditions exceptional or extreme, then i suggest you sell your boat and buy an RV; you are going to find yourself very surprised if real weather rolls in. Furthermore, I have sailed from Port Huron to Tobermory multiple times and each time took less than 25 hours...thats one day sailing. If you really cant handle a one day transit to get to a wonderful cruising ground, then just stick with the featureless, power boat-ridden seaweed puddle they call lake st Claire and get a flatscreen TV installed in your boat. Or perhaps you should head down to south bass island and embrace the tourism. That isn't what cruising is about. PS The swimming is very refreshing once you get past the shock. I'm usually not the 'glass half full' kind of guy, but, I'm thinking I'd like to see more of this kind of negative post about this area. I hope to get up there - maybe as soon as next summer - so the more people that think that the North Channel is a crappy place to sail, the more anchorages I'll have to myself. It was a joke. Sheeesh, get a grip people; it was a joke. Last edited by xort; 11-27-2008 at 10:23 AM. Well if you want to get bit by a Missasauga, you have to run around naked. They never git like baseball bats unless you consider those "free" bats you got at the Blue Jays games real bats. Their fangs ain't large enough to penetrate clothing. Now if you are of the admiral gender and do this, please post where you will be ;-) I remember that carpet of ivy camping on South Manitou in Lake Michigan. I think it was the dominant species. But the views of Sleeping Bear at night were worth it. Last edited by geraldartman; 12-17-2008 at 09:43 PM. 1 Attachment(s) Upgrade after 1/2 season?